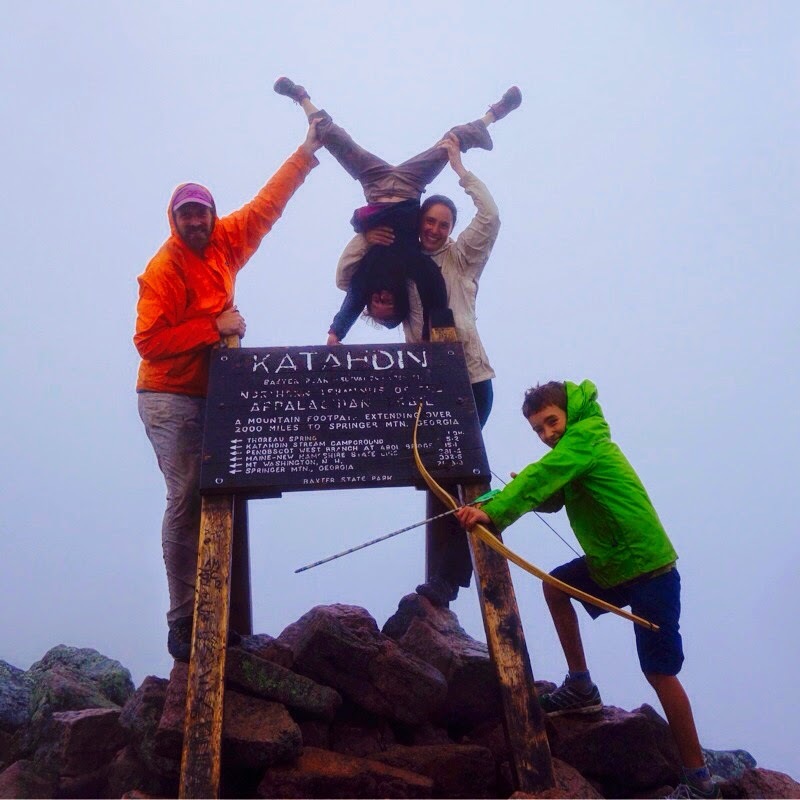 On August 31, the Kallin family—parents Dave and Emily and children Nathan and Maddy—reached the summit of Katahdin. The clouds that cloaked the peak’s long shoulders let them see only a few feet in front of them; there would be none of the spectacular views they might expect from Maine’s tallest mountain on a clear day. Moisture soaked their jackets and slicked the rocky trail they still needed to descend. None of that dampened the celebration, however. All four had just walked the entire length of the Appalachian Trail (AT)—2,185.3 miles in 154 days—starting at Springer Mountain in Georgia on March 31. A thru-hike is an accomplishment for anyone, but it is a special accomplishment for a family with young children. During the family’s five-month thru-hike, Nathan, age 9, and Maddy, who turned 8 on the trail, finished second and fourth grade by doing homework on the trail and answering questions from teachers and classmates on the blog that their dad updated regularly. As is true with most AT thru-hikers, each member of the Kallin family earned a trail name. Maddy acquired hers on the first day after doing a cartwheel. She remained Cartwheel throughout the hike. Nathan took the name Mouse a few days into the trip, but changed to RobinHood after he fashioned a bow and arrow from materials he found along the trail. Dave became known as All In, and Emily was Mama Bear, a name that is apparently unavoidable if you’re a mother hiking with children on the trail. After completing their trek, the Kallins returned to their home in Portland, Maine, on Labor Day. Nathan and Maddy started school the next day. I caught up with the family after they’d been back home about three weeks and asked them to talk about their experiences, what they’d loved, what they’d learned. Where did you get the idea for hiking the Appalachian Trail as a family? Dave: In 2002, before we were married, Emily and I hiked the AT north to south, starting in Maine and finishing in Georgia. On that hike, we met a family of four from Idaho. Their children on that hike were similar in age to ours now, 6 and 8. We were inspired by them, and thought we’d like to do the same someday. We tried to locate the Idaho family for years afterward, without success. Then our family was interviewed by NPR on the trail this year at Harper’s Ferry. Friends of theirs recognized them from our description on the radio and they got in touch with us. Their kids are in college now; it’s been great to hear how well their kids are doing. It makes us think that these hikes are still pivotal moments in your lives, years later. We started our thru-hike this year on same day as another family we’d met four years earlier on a hike in the White Mountains. That wasn’t something we’d planned—just independent trajectories. It was a happy accident to start within hours of each other. What is it like to be on the trail as a family? Emily: People don’t realize that there’s very little downtime on a thru-hike. They may think it’s a relaxing vacation, but there’s not a lot of relaxing about it. We hiked all day—we usually left camp by 7:30 a.m. and would stop for the day between 6:30 and 7:00 p.m.—to keep on track for an end-of-August finish. I put a lot of energy into keeping everyone uninjured and fed. What are some things that you remember most from the hike? Maddy: When we started, I didn’t think I could hike the whole trail. Once we got to New Hampshire, that’s when I knew I could make it. Getting to the top of Katahdin was a high point. Yes, I’d been there before, but I had just completed a two thousand, one hundred eighty-five and one-third mile hike! I definitely remember squeezing water out of my socks at night and putting them in my pockets to dry. Nathan: I liked hiking with my family. I liked meeting other hikers and hiking with them. Since we’ve been back we’ve Skyped with someone we met in Shenandoah. That was really fun. When I had my downtimes, I wanted to get off the trail. In New Hampshire, Maddy had a fever and was really tired. If she didn’t get better, we would have to get off the trail. I didn’t want to get off. I brought her stuffed animal to her, and I tried to make her a stick doll. How would you say the trail has affected you as a family? Dave: Our experience is that hiking the AT strengthens the trust between us as family members. Organizations like Outward Bound were founded on the premise that spending time together outdoors builds teamwork and community, strengthens relationships. I think there’s something to this. You get the great and the hard all together. You learn what someone’s really like. You forgive the things that annoy you, because they’re there with you. And you appreciate the great things they bring to the family. As parents, we got a better sense of the scale of things in our children’s lives. When your kids are in school all day, they’re holding it together in front of authority figures and other kids, and saving their down moments for parents. If we spend an hour and half together at the end of their schoolday and my workday, and they complain for most of it, that’s a high percentage of our time together. But if they complain for an hour and a half on the trail, we’re still together the other twenty-two and a half hours. We got a higher percentage of their good times. We also saw something really remarkable in their interactions with other people along the trail. It’s unusual in society for adults to interact with a kid on a peer-to-peer level. In school, kids are age-stratified by grade. Adults don’t always know how to talk with young kids without talking down to them. On the AT, you’re hiking the same trail, doing the same things. It was easy for our children to talk to other hikers about their experiences on the trail. They had hours for long conversations about books, or to listen to someone’s life story, or learn a game or a skill. Both kids matured in the way they interacted with adults. How does it feel to be done? What has the transition been like? Maddy: It was a bit of a weird transition, but now things are pretty much back to normal. Emily: Now that we’re back, I have to keep really busy. After the relentlessness of life on the trail, I get antsy if I’m not doing something. I jumped right back in to our life here, mowing, weeding, cleaning, getting our life back in working order. We’ve gone from being together 24 hours a day to having separate lives. But even without the daily closeness, we’re more of a team now. We have more group discussions. That is something that happened on the trail, and it’s carried over at home. Dave: Life is much crazier than when we just got up and walked each day. It’s been a very different transition than what we had after our hike in 2002. In 2002, we had to ask ourselves what came next. This time, we jumped right back into existing lives. I returned to my job [as a lawyer with Drummond Woodsum], Emily went back to running the family farm, and Nathan and Maddy had school to come back to. It’s crazy how quickly we’ve gotten used to being back in our old lives. This past weekend, we went back to Katahdin. The family that we started the trail with was finishing their hike. We saw a lot of the hikers we’d been on the trail with. It had been only three weeks since we were on the summit, but I was already an outsider in that world. It becomes a happy memory very quickly. 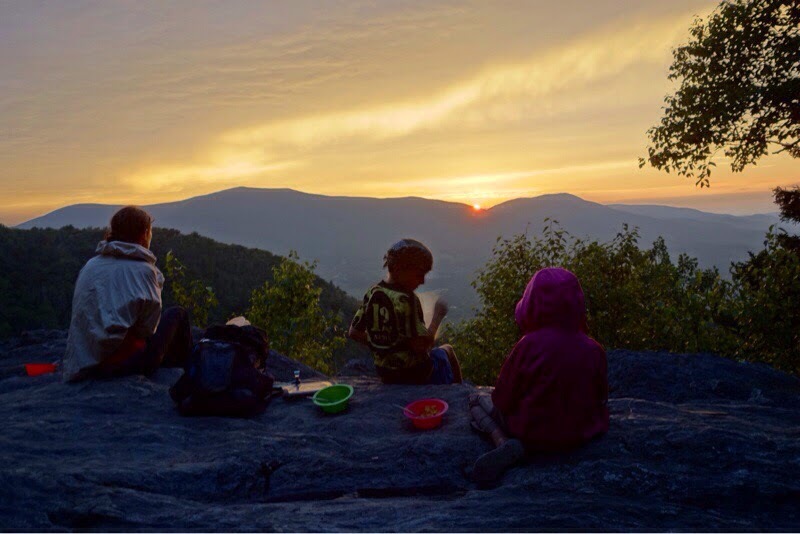 Do you have any gear tips or suggestions for families considering long hikes like the AT? Emily: Research your gear. Light packs make a difference. Maddy’s pack weighed about 4 pounds, Nathan’s 8 or 9. My pack was between 20 and 25 pounds, Dave’s between 30 and 35. Our group weight was light enough that we could take the kids’ packs if they needed the break. That made a huge difference in morale. Dave: If I have one piece of gear advice, it’s to err on the side of bringing less. We had a modular approach to gear throughout the hike. At different times and in different combinations we used a one-tarp tent that we set up using trekking poles, a tent for two people, and hammocks for the kids. We could send cold-weather gear home and get it back when it cooled down again. We were also efficient with space. Our “four-person tent” was billed as a two-person tent; Nathan slid in next to us, and Maddy was small enough to sleep perpendicular to the rest of us. Emily and I have quilt-style sleeping bags that lend themselves to a layering system. When you hike with kids, they’re going to grow out of things along the trail. The economics of gear also changes for a long hike. We were willing to invest in fixed-torso backpacks for both kids because they were going to wear them every day for five months. Emily: We’ve promised to put a gear list up on our blog with more information. What advice would you give other children and other families who are interested in the AT or other long hikes? Maddy: Just try it. See if you might be able to. Nathan: Keep going. Get out and backpack with your family as much as you can. Emily: Don’t overplan. All your plans will change. There’s really no difference in kind between the AT and shorter backpacking trips. The skills you need to backpack for a week are the same as for one month or more, though the length does change some things. Just don’t get discouraged. Thru-hiking is not for every family. It’s logistically difficult. People can have a really hard time with the pace. A thru-hike is not a good choice if you want to stop often, hang out by a lake, or have more downtime with your family. Injuries make it really tough. The experience is very different for different people. Everyone can get out and enjoy nature. Don’t be constrained by what seems right for other families. My advice is to find what’s right for you. To read more about the Kallins' thru-hike, visit their blog at kallinfamily.com. Great Kids, Great Outdoors is an Appalachian Mountain Club blog. This post was written by Kristen Laine.